Our adventure begins at mightymacswim.com. Thank you, in advance, for helping me to raise $2,800 or more, to support Habitat for Humanity, and get the opportunity to swim the straits on Monday, September 7, 2015. Check out my Mighty Mac swimmer profile. 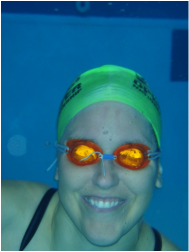 To make a tax-deductible donation to Habitat for Humanity in my name, please click on Donate at http://www.mightymacswim.com/ and when you check-out, click on “add special instructions to the seller,” and enter my name before submitting. 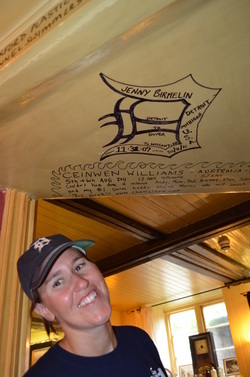 In high school, Jenny volunteered to work on a Habitat house in Detroit, Mich.
take-away pizza and ice cream. The next day, I met Channel swimmers and hopefulls and signed the wall at the White Horse Pub in Dover, to make it official. 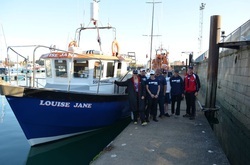 Jenny Birmelin's English Channel Swim, August 20, 2011. 11:31:07, 24 nautical miles, 28 land miles. 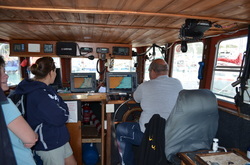 We met pilot Andy King today, and took a look at his gps screens to see which boats were out. We compared the routes of his last few English Channel swimmers. In the small cabin, there is a stove for hot coffee or tea. This is the back of the Louise Jane, where the crew will spend most of their day during the swim. 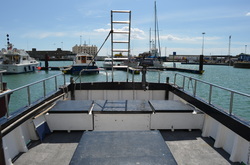 Welcome to my website and blog, covering my journey to swim the English Channel in August 2011. Thank you for taking an interest in my endeavors. Please consider donating to my swim under the Support tab. Thank you. Since I was a little girl, living a "bathing suit-flip-flop" pool life during the summers, I told my mom that I would someday get married in a white Speedo since I was not the dress type. I put on my bathing suit for swim practice in the morning and took it off past dark, when the swim club closed for the day. My first bathing suit I was proud of was red with Snoopy dog houses and rainbows. There have been hundreds of swimsuits since Snoopy. When I put on my suit, it's like going to work for most people. Only, it usually leaves me more energized and healthier in the long run. I met my husband at a Michigan Masters Swim Meet in 2003. He proposed in 2005 and surprised me with a white Speedo. We were married on Lake Huron in 2006. I got to wear the white Speedo for the beach rehearsal. Around the same time, I also fell in love with something else. Open water swimming. It took a while to become comfortable looking at sea creatures and waiting for the unknown to make itself known. It took a few near hypothermic swims, and a little bit of swimming off course to rattle my bones. Then, it happened. Landmarks around the lake that I always looked at, were no longer objects, but rather, destinations. Last September I looked out into Tawas Bay/Lake Huron, and saw the US Gypsum docks a few miles north and south. I started wondering how many miles I was from my new goals. My supportive husband hopped on a jet ski with a walkie talkie, and idled next to me for a few hours until I reached the Marina. He talked me through my fears of swimming close to the gigantic docks. We celebrated that swim with a hot shower and hot pizza, all the while I wondered, "How far is a swim to the lighthouse?" A year has passed and I'm still tested by each and every swim. Every swim is unique and presents its own challenges. My April Alcatraz & Golden Gate charity swims with the Foundation for Aquatic Safety & Training with over 50 kids were thrilling. Every single age group swimmer (ages 8+) swam from the Rock to Aquatic Park. After the Golden Gate Bridge swim, I learned I needed motion sickness medication while waiting on a boat for an hour in a steady rain. Bob Roper taught us about the ebb and flow, slackwater and perfect timing. Swimming to the US Gypsum "crib" in June wasn't as scary as I thought, despite the buried wires and planks I swam over. Swimming to the Tawas Point Lighthouse in June after the fish fly hatch was a story in itself. Aborting a swim on July 4 morning, from the Lighthouse to the Gypsum "crib" due to seasickness was a learning experience. I learned I needed Dramamine during the wavy swims and I was sick of gels. I knew something felt wrong and called it quits. I pushed my back to the limit, even after an MRI in March said I had L5-S1 facet arthritis. For months, I stopped doing flip turns at the doctor's request, and with the help of tremendous physical therapists and techs, I strengthened my core, and mind. I knew I couldn't swim as much as I had been. I began to strengthen my core, to help support my back. I had my first cortisone injection, less than three days before my 6.2-mile swim at the USMS 10k Open Water National Championship in Noblesville, Indiana, July 17. I was in agony in the ~85-degree water but toughed it out. In mid-August, I decided to join a group of men on a swim adventure across Lake St. Clair. I was hoping to maybe swim 8-9 miles after my final cortisone injection. The terrific group and wonderful cause inspired me to want to complete the swim (www.swimmingstclair.com). After eight hours and forty minutes of mental focus and freestyle, we reached the Grosse Pt. Yacht Club, 14.21 miles, from the starting point near Harsens Island. That was my first experience with what the body goes through around the fifth or sixth hour of swimming, when your body exhausts its carbohydrate reserves and you hit a low point. The high point was nearing the yacht club and seeing my husband and friend cheering from the breakwall. My loving family and friends are the greatest supporters, even my 93-year-old "Irongranny," who gets very worried about my long swims. Next up: another year of cold showers, cold swims, fundraising, and lots of pool laps over the winter. Ninety-four years young, my "Iron Granny"
Two summers ago my grandma’s vehicle nearly robbed her of her youth. My then 91-year-old grandmother, who I nicknamed “Iron Granny,” was exercising two hours a day up until a car accident on July 6, 2008, left her in intensive care with multiple broken bones and steel in her arm and legs. There were several weeks when she felt like giving up and occasions when I left tears in her hospital room. I was determined to help her mind and body maintain their youthfulness while restoring the fight in her weary eyes. I hung my swimming medals on her IV and a poster on her wall saying, “Iron Granny, you’ve got to move-it, move-it.” When physical therapists asked her to do ten repetitions, I suggested 15. Her physicians called her “miracle lady.” After one year of surgeries, nursing home care, physical therapy and occupational therapy, she moved back into her own apartment. Now 93, and still accepting challenges by her physical therapists, she and I keep each other running younger for longer. She says my energy and athleticism keeps her going; but truly, it’s reciprocated. My passion for swimming is strongly supported by her willpower and courage. A year ago, I swam in a 10k open water swim race in chilly 61-degree Lake Michigan water and the thought of her progress propelled my stroke. While I’m 33 and her, 93, we keep each other healthy and feeling young. On my last birthday, she told me I had 60 years to catch her. Comments? Or send me your favorite swim set. 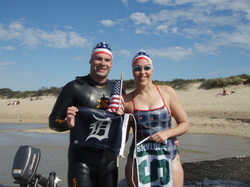 First Lake Huron swim was Sunday, May 15, 2011. The water was 47 degrees F and the air was 48 degrees F, winds out of the NNE 20-40 mph. These waves, which continued for two days straight, were some of the largest I've seen in a few years. Birmelin's showshoeing at the Tawas Point Lighthouse on Lake Huron. 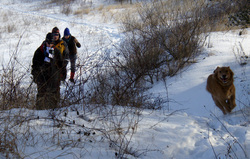 JD & Sophie, Lake Huron, January 2011. Our dog is not a stay on-the-dock dog. She trains with me. And keeps up!